So here's your shot, courtesy of Conan O'Brien. And here's your chaser (though you might need another shot - pardon the pun - after). The excitement is building. You were chosen by a humanitarian group to travel to Haiti to work. But now what? How to prepare? Do you need immunizations for Haiti? How will you stay healthy? What about malaria prevention? Is there anything else to consider? What you need depends upon how long you will stay and how often you plan return travel to Haiti. You will need both routine and travel immunizations. If possible visit your travel medicine provider 4-6 weeks prior to departure to help you prepare for your travel to Haiti. If you don’t have that much time, don’t worry, schedule the visit, partial immunity from vaccines and, more importantly, malaria prevention, self-treatment of common illnesses can be discussed at the visit. Hepatitis A– this nasty viral infection of the liver is often spread thru food or water. This is strongly recommended for anyone traveling to Haiti. Full immunity requires 2 vaccines 6 months apart. Don’t worry if you don’t have time to get both doses prior to travel, 90% of people are protected with the first vaccine. Typhoid- is also spread through food and water. You know you don’t want high fevers, belly pain, and diarrhea so get protected. Tdap– This is the tetanus shot with whooping cough built in. Now you are protected if you get a cut or scrape as well as from whooping cough. Influenza– Do you really want to be sick with the flu while you are there? Do you really want to spread this around to your fellow humanitarians? Enough said. Malaria vaccine– It isn’t available (yet). I included it as I get asked about this all the time. You will need to discuss malaria prevention with both medication and mosquito bite avoidance with your travel medicine specialist. Hepatitis B – you will want protection from this viral infection of the liver. It is spread through contact with body fluids; if you cut yourself and need stitches or need any other medical care you could be exposed. If you will be working in health care, returning to Haiti multiple times or travel internationally frequently you should seriously consider protecting yourself against Hepatitis B. It requires 3 doses of vaccine over 6 months. The other ways of contracting Hepatitis B should be avoided while traveling: tattoos, piercing, and new sexual partners. Rabies-Animal bites are serious business, often requiring evacuation for proper care. If it is within your budget and you will be staying a long time or visiting often, protection with vaccination is advised. Many people choose instead to learn how to provide first aide for a bite and purchase travel health insurance to cover evacuation for treatment with vaccine and HRIG. Yellow Fever is not needed because the disease is not present in Haiti. Caveat: if you are coming from a country with Yellow Fever, you will need to show proof of vaccination prior to entry to Haiti. Check your routine vaccines. Many people are unaware they need a booster. Varicella (Chicken Pox)- you will need two doses in your lifetime or have had the disease. MMR (Measles) -requires 2 doses in a lifetime. Pneumonia-People who smoke or have asthma need the pneumonia vaccine too. Check with your health care provider to see if you are up to date with these. You need more than vaccines to prepare. Vaccines are only the tip of the iceberg when preparing to travel to Haiti. You will need to prevent Malaria, Dengue, Cholera, and traveler’s diarrhea. The medical system in Haiti is overburdened and was severely impacted by the recent earthquake. You will want to make plans to receive any needed medical elsewhere. A future post will address these issues. Schedule an appointment with your travel medicine specialist for the most up-to-date advice about staying healthy in Haiti. If, as Maher and O'Brien gratuitously (illogically) tell us 'Haiti Is Great Already', why would the CDC put out a substantial warning as to the horrifying health risks of venturing to the oldest Black republic in the world? I know the president was beaten up even on comments he made about Haiti, and I can speak firsthand about Haiti, because as a young Navy SEAL officer in 1994, Bill Clinton decides to invade Haiti. I was there. My SEAL team ended up sending two platoons, and we actually planned for 100 percent casualties, not from enemy fire, but because of the water quality. We had to swim ashore, and the water was so bad because there were two and a half million people with untreated sewage flowing right into the water that we were going in. We had to get so many shots, so many vaccinations, that none of us could donate blood for six years afterwards. So if the president says some places are shitholes, he’s accurate. Literally. 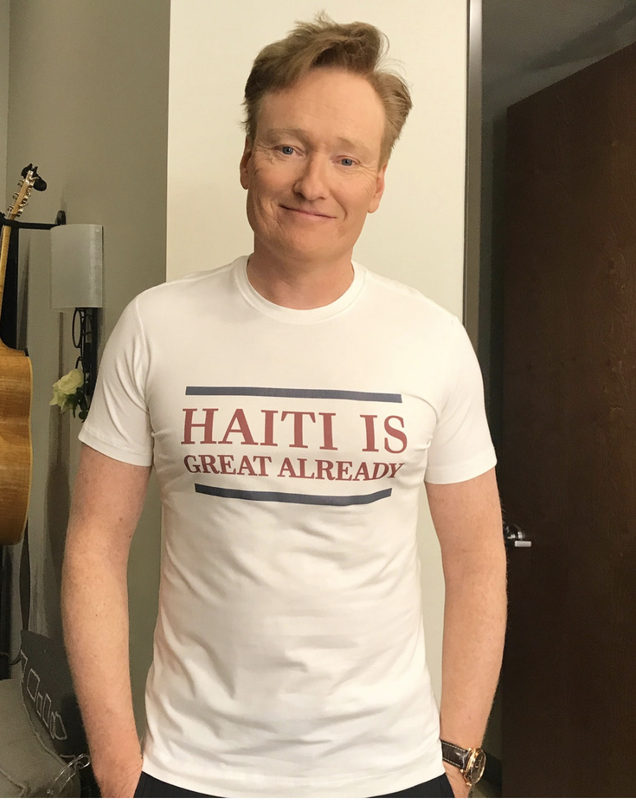 Sorry, Conan O'Brien and Bill Maher: you cannot say "Haiti Is Great Already" or wear a t-shirt with the same moniker and magically eliminate the conditions individual black people have—uniquely—collectively created on an island they conquered via genocide of whites in the Revolution of San Domingo. Haiti is not great already. The quality of life black people have created in Haiti is just another reminder #WakandaIsntReal. And, no, you can't drink the water when you visit Haiti, the clearest indicator the oldest black republic in the world is not currently and never was great.